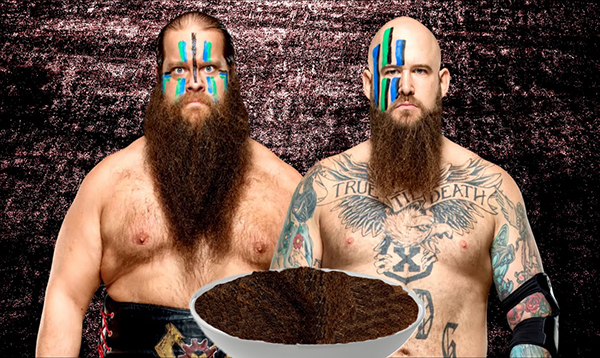 Headlies: “The Official WWE Cookbook” War Raiders Recipe Made Entirely Of Hair - WrestleCrap - The Very Worst of Pro Wrestling! Stamford, CT – WWE officials have revealed another recipe for the upcoming “Official WWE Cookbook” just in time for the Royal Rumble. 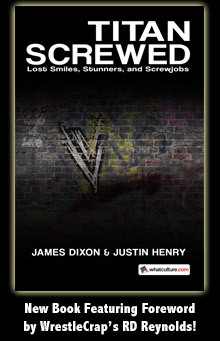 The cookbook, which contains recipes such as Dean Ambrosia Salad, Mimosa Joes, Braun Beef Stroganoffman, and Zack Ryder’s Microwave Soup For One, was formally announced by WWE Chief Brand Officer Stephanie McMahon. McMahon audibly gagged while introducing the dish’s namesake. The War Raiders Bowl Of Body Hair, named after the NXT tag team, contains an arrangement of head, beard, back, shoulder, and chest hair. There are no spices, condiments, or garnishes used in the bowl. Rowe and Hanson yanked out handfuls of hair and then sprinkled it into a bowl. “Eat it! Eat it now!” commanded both Superstars. Terrified reporters took large spoonfuls of the “food” and struggled mightily to swallow the coarse hair. War Raiders have vowed to serve their signature dish to all their opponents and internet commenters. 5 Responses to "Headlies: “The Official WWE Cookbook” War Raiders Recipe Made Entirely Of Hair"
I’ll take a slice of some Mandy Rose-t beef slathered in some JR’s bbq sauce. Yeah, I just bet you’d like to eat ou-uh, eat Mandy Rose. Recipe includes a section on “how to deal with peritonitis”…. I forgot about AJ Styles the conspiracy theorist from 2017. His comments about ‘no one saying that planets exist other than NASA’ is ignorant of history AND science (and math, literature and philosophy for that matter). And his insinuating that what people believe is as legitimate as actual proven facts is laughable at best. One too many blows to the head from those amazing last man standing matches at TNA? Damn – my favorite wrestler, maybe the best ring worker of all time – may be a pinhead as the late, great Bobby the Brain would say. Then again, how could the conspiracy theory / flat earth bit be worked into an angle for AJ? Every time he uses a roundhouse kick, we can call it a “flathouse” kick. And a moonsault would be a “NASA faked the landing” sault since we never have been to the Moon. And the sunset flip becomes the “Sun spinning around the sky 3,000 miles above the Earth” flip. Need to get that terminology styled correctly. See what I did there? Eat it, Eat it NOW!! !